On Jan. 5, 2019, Jonathan Quick set a Los Angeles Kings record by recording his 300th win as the Kings shut out the Edmonton Oilers 4-0. Quick stopped everything the Oilers threw at him, but that wasn’t much. Throughout the game, the Oilers only had 16 shots on net. The Kings are struggling this season, but the Oilers game was a rare good night for the team. Not only did Quick get his 300th win, but Anze Kopitar also scored his 300th goal. 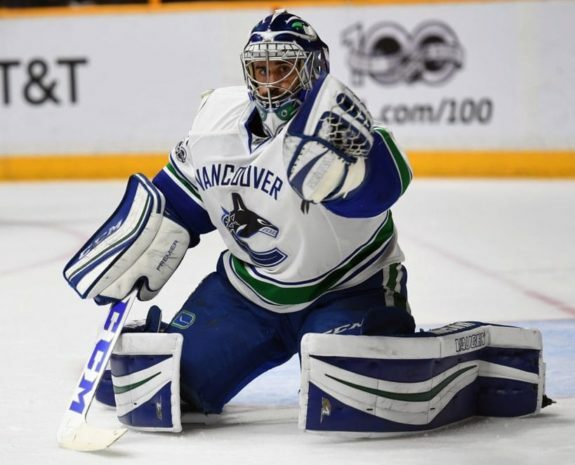 Of all American-born goaltenders in NHL history, only Ryan Miller reached 300 wins faster than Quick. It took Miller 566 games to get 300 wins. Quick did it in 575. Quick’s next win will tie Mike Richter for fourth place for NHL wins for an American goalie. Ahead of him on the list for wins by American goalies are John Vanbiesbrouck and Ryan Miller, with 374 wins each. Tom Barasso has 369 and Richter has 301. In NHL history, only 10 goalies have reached 300 wins faster than Quick. That list includes such goalies as Hall of Famer Jacques Plant (who took 521 games), Andy Moog (543 games), still-active Marc-Andre Fleury (547 games), 2018 Hall of Fame inductee Martin Brodeur (548 games) and still-active Pekka Rinne (552 games). Starting as a 1967 expansion team, during the Kings’ history as a franchise, only three goalies have had more than 100 wins. Quick leads the franchise in wins by a wide margin. Rogie Vachon is second with 171, and Kelly Hrudey is third with 145. Quick’s first win came in his first game with the Kings on Dec. 6, 2007, against the Buffalo Sabres. That win was as easy as number 300. In that game, by the second period, the Kings (not a strong team that season) gave Quick a 7-0 lead. Of the 17 shots Quick faced that night, he stopped all but two. The Kings won 8-2. The rest is Kings’ franchise history. Quick became the best goalie in the team’s history. His first career NHL shutout was on Dec. 23, 2008, when the Kings beat the Columbus Blue Jackets. His career shutout total is now 51. This season, the Kings are struggling. Their record is 17-24-3, and they are in last place in the Pacific Division. In light of the team’s overall lack of strength, the 32-year-old Quick’s record, which is only 7-10-2, isn’t that bad. In addition, he was injured early in the season and needed meniscus surgery. He’s healed now and has been playing better over the last seven games, recording a .921 save percentage (SV%). For the season, he has a .902 SV% with a 2.88 goals-against average (GAA). That said, during his 12 seasons as the Kings’ starter, with good teams and bad, Quick has only had one losing season. That was his first season, 2007-08, when he played three games and had a 1-2 record. 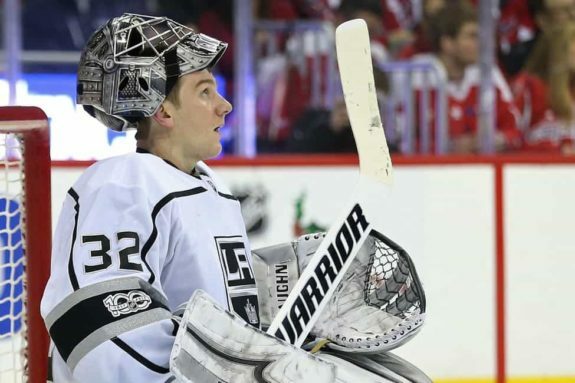 In 2011-12 and 2013-14, he backstopped the Kings to their only two Stanley Cup victories. At 32, Quick isn’t old for a goaltender. He’s signed for four more seasons with a $5.8 million cap hit. However, he doesn’t have a no-trade clause in his contract and he’s on a team where only Drew Doughty and Kopitar are untouchables. It’s possible Kings general manager Rob Blake might trade Quick if a good offer comes along. The team certainly needs to get younger and, as the trade deadline approaches, it will be interesting to see if any Kings players are moved. Quick might be one of them.